The Cadaver Dans entertain guests before the Boo To You Parade which is part of Mickey's Not So Scary Halloween party in the Magic Kingdom, Walt Disney World, Orlando, Florida. Nikon D700/50mm, 1/60s, f/4, ISO 1600, EV +0.6, rear-sync flash. The Cadaver Dans entertained us before the Boo-to-You Parade during last week’s Mickey’s Not So Scary Halloween Party in the Magic Kingdom, Walt Disney World, Orlando, Florida. This deathly barber shop quartet may be familiar to you as the Dapper Dans who fill up Main Street USA with their award winning tunes the rest of the year. They set the scene nicely for the parade which is more fun then scary. 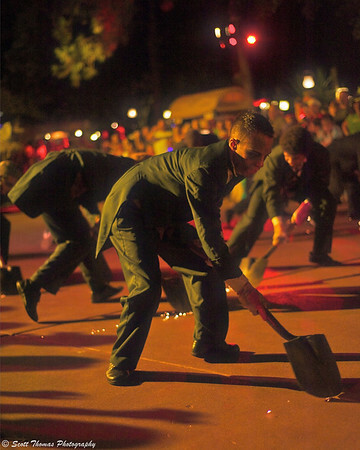 Haunted Mansion ghoulish butlers added some sparks to the parade with their grave digging shovels. Nikon D700/50mm, 1/400s, f/1.8, ISO 3200, EV +0.6. Haunted Mansion personnel were a big hit with the crowd from shovel scrapping butlers to those lovable hitchhiking ghosts. Even some of the party goers from the famous ballroom scene took a break and joined in the parade. Familiar characters like Eeyore put on their favorite costumes to the delight of young and old. Nikon D700/50mm, 1/125s, f/2.8, ISO 1600, EV +0.6, Rear-sync flash. 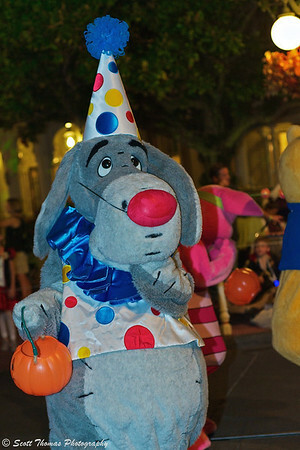 Many of Disney’s most notable characters donned their favorite Halloween costumes including Eeyore from Winnie the Pooh fame in his clown outfit and joined in on the parade to the delight of both young and old. 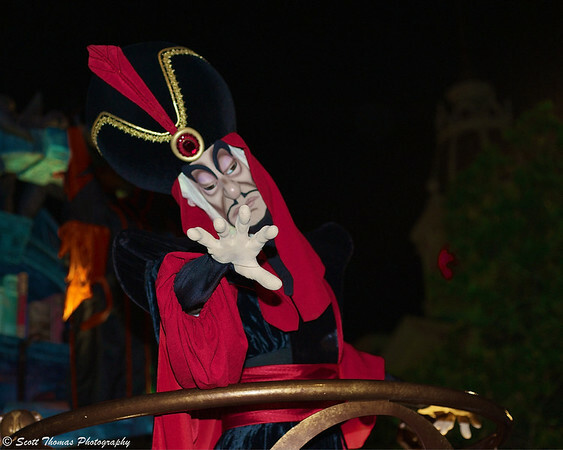 Jafar, the villain in the animated movie, Aladdin, gives me his best scary look. Nikon D700/50mm, 1/250s, f/2.8, ISO 1600, EV +1.0, Rear-sync flash. What’s a Disney Halloween parade without the villains? Here is Jafar from the animated movie, Aladdin, giving me his best scary look. As you can see, the parade was a challenge to photograph. I’ll be doing future blogs on how I handled the two night time parades I was able to photograph while visiting Walt Disney World. This entry was posted in People, Travel, Weekly View and tagged 50mm, boo to you, cadaver dans, flash, florida, magic kingdom, makeup, music, nifty fifty, nikon D700, orlando, parade, Photography, rear-sync, singing, songs, walt disney world. Bookmark the permalink. This is a fun parade! We didn’t go to MNSSHP this year but have benn in the past. My favorite part is the headless horseman ride. Last year, we sat in VIP right at the bridge in Liberty Square and got to see him start his ride. So cool! I agree that photographing the parades are really tough! If you use too much flash you lose the feeling of the parade; not enough (or none) and you run the risk bluring due to not a long enough shutter speed. My favorite shot here is actually of the goulish butlers. I love it when the sparks fly off of their shovels! A few years ago, I saw the Headless Horseman gallop down Main Street USA. Now, he trots by. Not as impressive but he does move the lighted Jack-O-Lantern around more. The horse is still very beautiful. First time they hit the pavement with those shovels I jumped! That one I took without flash but had to do a lot of post processing to get it to look good. Rear-sync was a good compromise. Also used it for the Main Street Electrical Parade. I was admiring the photos and thinking what a surprisingly elaborate Halloween parade Syracuse had . . . what was I thinking! It’s always fun to go on a Disney expedition with you. It’s like visiting an entirely different planet. Interesting images. I look forward to learning more about night photography. LOL…yeah, Syracuse has a good St. Patrick’s Day parade but nothing like this. Disney is almost like being off planet. Definitely a fantasyland. Looks like the staff had a good time too! Great shots! Oh, the Cast Members (Disney employees) had a blast, too. Lots of special events during Mickey’s Not So Scary Halloween Party which must be a nice break from the daily routine. Thanks, Chloe! Glad you enjoyed them, creepy and all. Eeyore is my youngest daughter’s favorite, too. We found him dressed up as a mummy later in the week and she had to get her picture taken with him. Eeyore is a big favorite of mine! I echo Michaela’s sentiments in loving that picture. 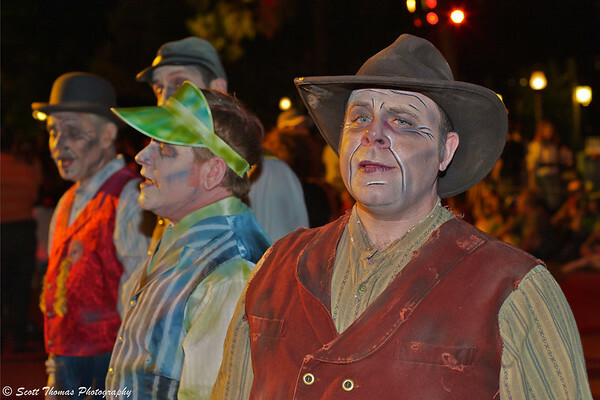 How perfect to see mournful Eeyore dressed as a clown! My thoughts exactly, Karen. Perfect! Great captured Scott. Night photography is a challenge to me and looking forward to reading more about it. I got a few blogs planned about shooting night parades and fireworks in the coming weeks. Stay tuned!